Tacoma Narrows Monochord is a new percussion theater and media performance work that instrumentalizes archival footage and historical narratives related to the Puget Sound in Washington State. This multi-movement “pocket media-opera” features 20 video, sound and movement interactions. 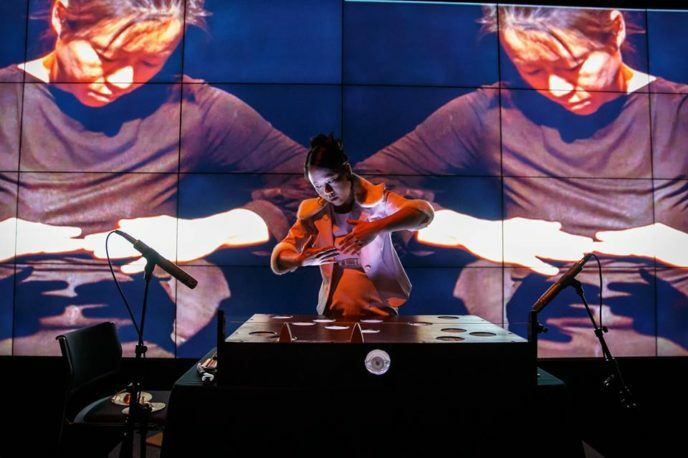 The video consists of archival footage from the Wende Museum and Archive of the Cold War, footage of the Tacoma Narrows Bridge collapse and of percussionist Aiyun Huang in 8 separate costumes designed for the piece. Vivid juxtapositions are spun into an imaginary theater work of poetic quotation construed of intimate home-movies, civil engineering disasters, American-Chinese labor histories, poetry and a moon goddess with a rabbit. At the center of the work is Huang playing a new sculptural soundbox instrument. Wired with tense strings and electronics, it emits shifts in highly-refined finger percussion techniques and exploits the strings’ resonant properties through extended, electronically enhanced drones. For this piece, I worked closely with Dr. Huang and composer Dr. Sean Griffin to design a new musical sculpture which could create the sound world for this piece. To mirror the distress and and eventual collapse of the Tacoma Narrows Bridge, we created a monochord whose string could, at the apex of the piece, be dramatically cut by Dr. Huang. A series of unseen internal drone strings tuned to the harmonic series of the outer string are driven by electromagnetic inductors. We used piezoelectric elements to create a novel interaction where Dr. Huang could conjure a singing bowl timbre by gently rubbing the top surface of the instrument. We enlisted the help of cognitive neuroscientist Dr. John Iverson to map and capture Dr. Huang’s movements in performance, data which I used to create sonic tension above the drones. Artist Joe Yorty fabricated the woodworking of the instrument and I created the interactive software driving the sound design. Among the Mad [Relapse] is a contemporary re-telling of Lewis Carroll’s Alice’s Adventures in Wonderland. Ally is a woman with a vivid memory of a peculiar experience in a magical land of Wonder. Ally relapses down the rabbit hole where she clearly has been many times before, and retraces the familiar adventure. The first character she meets is The Rabbit. Is this character real? Does her memory deceive her? To support this uncertainty, the bass clarinet (Ally) and flute (The Rabbit) tentatively dance around one another, unsure how they should interact. Apprehensive drones amplify this tension. Over time, the woodwinds draw closer and eventually engage in harmonic dialogue. This project was funded by the San Diego Foundation’s Arts and Culture Individual Artist Fellowship Grant from the Creative Catalyst Fund under the sponsorship of John Malashock and the Malashock Dance Company. This grant was made possible by the Ariel W. Coggeshall Fund; The Creative Catalyst Fund; and the Colonel Frank C.Wood Memorial Fund of The San Diego Foundation, in partnership with the James Irvine Foundation. Phonautograms, moments of sound design for theatre, 2001-2016. How do you create tension that continues to build? For an especially sustained moment of agitation in Adjacent Possible, as dancers climbed higher and higher on precarious platforms, I programmed a Shepard-Risset glissando harmonizer, Perpetual Motion. The resulting audio illusion produces a minute of hair-raising anxiety in Air Raid as the pitch of the distorted guitars continues to rise. Moving in the other direction, descending flute melodies and vast reverberation add a languid dreaminess to Uneasy Love, underscoring the Lover’s Bliss in A Midsummer Night’s Dream. Meanwhile, Titania makes her regal entrance to a rich polychord of voices and a wash of shimmering cymbals. This collection assembles some of my favorite sound design excerpts from a decade and a half of theatre. 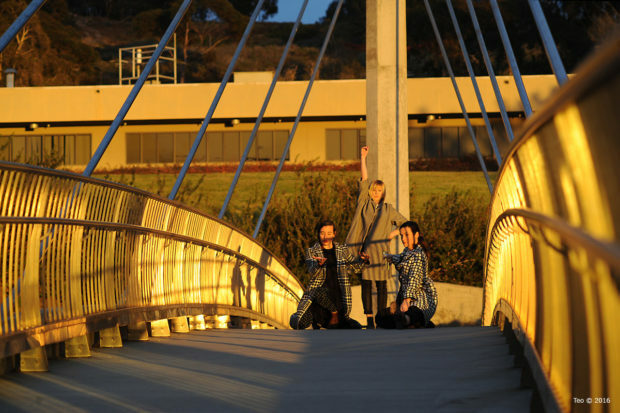 Foreground was a site-specific dance and media performance at the Scripps Institute of Oceanography. Commencing at the footbridge crossing La Jolla Shores Drive, the audience moves through an elevator, a conference room, and an ocean overlook during the course of the piece. To accompany this serpentine production, I created a unique sound world for each space. Within the elevator, I quietly strummed an acoustic guitar. Overlooking the ocean I created expansive washes of sound, but on the terrace I let the wind whistling through the trees fill the air. As the dancers’ brash movements transformed the suspension bridge into a concrete trampoline, I underscored with tense dissonances. As the sun set over the Pacific Ocean, this tension finally resolves. 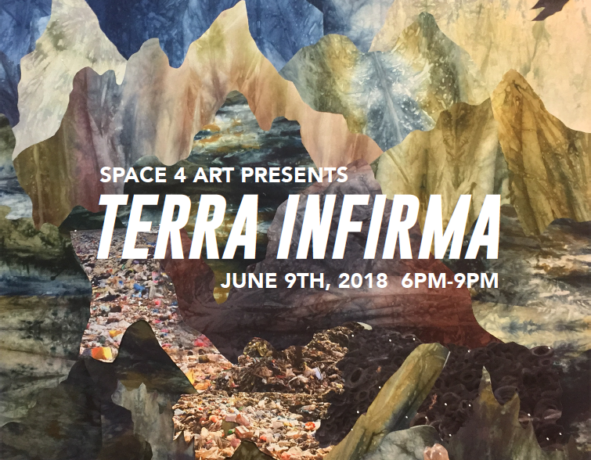 Terra Infirma was a site-specific collaborative multimedia performance addressing the overwhelming existential threats that human action and inaction pose to the environment and future life on planet Earth. What does the end of the earth sound like? How do you score an apocalyptic event? I imagined an inhuman breathing noise, like the last technological gasp of a dying culture, as this robotic death rattle fades to grey. 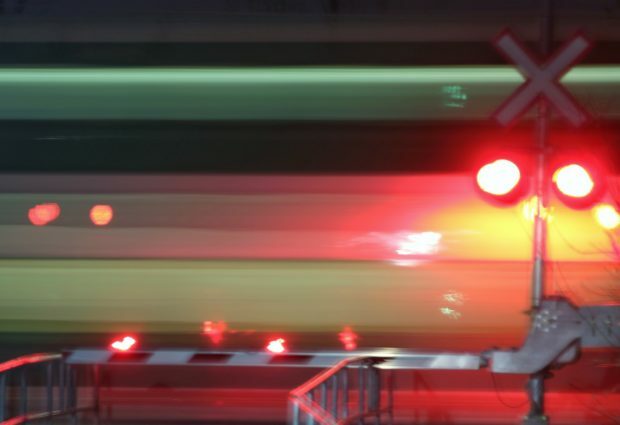 As this two-character play begins, one of the characters has just saved the other from throwing himself in front of a train. To drive home the immediacy of this event, I preceded this moment with the sound of a train rushing just in front of the audience, using this close perspective to launch the show.